The Long Goodbye (1973), directed by Robert Altman, is a contemporary film noir adaptation of Raymond Chandler’s elegiac novel The Long Goodbye (1953), the screenplay is by Leigh Brackett, who adapted The Big Sleep for the 1946 film. 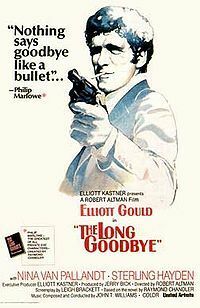 The Long Goodbye features Elliott Gould as Philip Marlowe, private eye, Sterling Hayden as alcoholic novelist Roger Wade, and Mark Rydell as gangster Marty Augustine. Unlike the novel, occurring in the 1950s, the cinematic version of The Long Goodbye occurs in the 1970s — a mirror of the lifestyle and culture of Hollywood in the 1970s. In their genres, the novel and the film are "a study of a moral and decent man cast adrift in a selfish, self-obsessed society where lives can be thrown away without a backward glance ... and any notions of friendship and loyalty are meaningless".